OH MY! I LOVE THESE! These came out so cute! At least I think so...even my husband thought they were pretty cool! 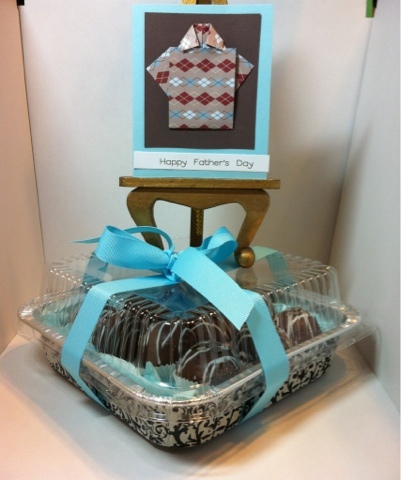 The bottom is chocolate made with a chocolate peanut butter cup molds, the top part is a cake ball! Then I dipped the cake ball part in pink candy coatings with mini M&M's and sprinkles on top! This particular one is a strawberry cake ball. The idea was from Bakerella's Cake Pop Book. Here is a picture of a group of my Cake ball cupcakes! I JUST love these! My boys can't wait until dinner is finished so they can devor these sweet treats! I was asked to work on pirate cake pops for a birthday party in July. As I was waiting for all my supplies to come in it got me thinking about sugar cookies! I love these little pirate guys! THEN I started thinking what else could I make with the same color icing that was already made and in icing bags! LADYBUGS!! So, There you go...doesn't everyone think Pirates and Ladybugs go together? After the boy's friends went home they decided they wanted to work on some cookies too! They each did 3 cookies. They love to get involved with my baking. However, alot of times I'm working on things for clients and they have to wait until I have a play day in the kitchen like today! Well got to go...Fajitas are ready! 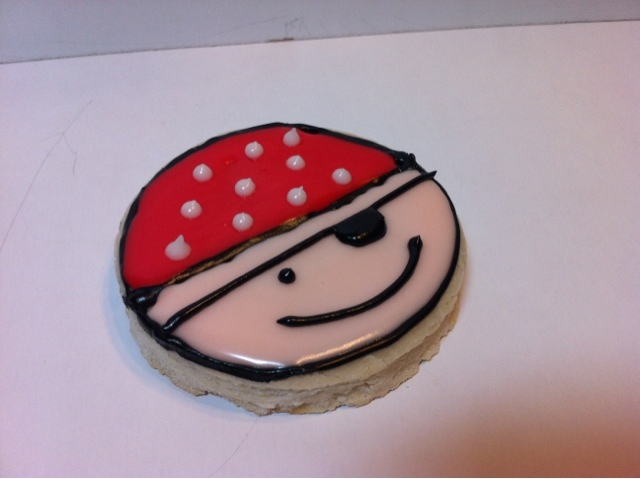 I was experimenting with sugar cookies for a pirate themed birthday. I loved the way it came out! I mainly concentrate on one layer of royal icing sugar cookies, but I went out of my comfort zone a little with these cookies. 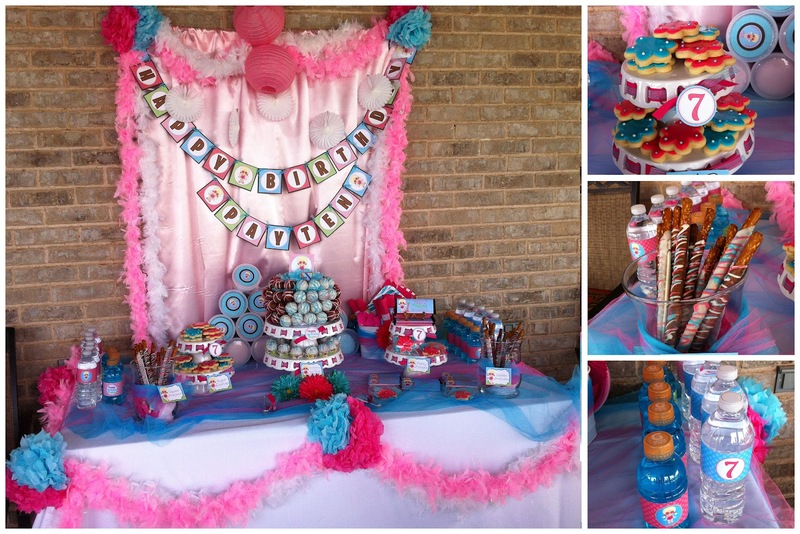 Here is a few pictures from a Dessert Table I did last weekend for a sweet little girl turning 7 years old. She was having a pool party...outside...in Texas...with tempatures of 100 degrees! Chocolate and heat do not mix! But we kept everything cool until it was time to eat our sweet treats! Here is the Sweet Dessert Table I did. All shades of pink and turquoise. I used white and pink feather boas, tissue pom poms, and pink lanterns on the table and on the backdrop. All the printables you see were printed and assembled by me, but we purchased them from http://www.pinkpicklestudios.com/ Brandy did an awesome job (especially with our rush order)! 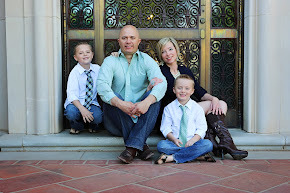 Check out here website for great party printables. Dipped Pretzel Rods in Chocolate in Vanilla with coordinating party colors. See my Sweet Prices Page for pricing on all the desserts you see here! 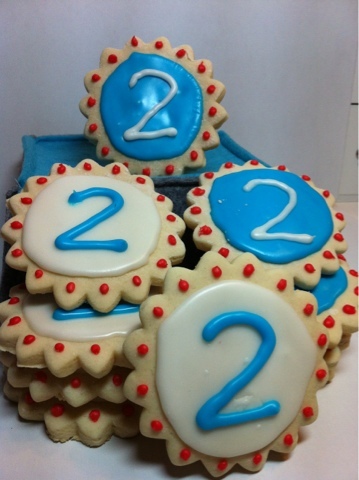 One layer icing Sugar Cookies in coordinating party colors. See my Sweet Prices Page for pricing on all the desserts. 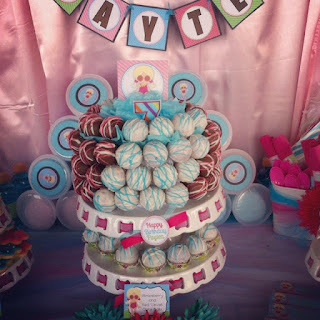 A cake ball cake for the birthday girl! We did Strawberry and Red Velvet Cake Balls. This was a smaller cake ball cake than I've have done in the past. This one had about 65 cake balls. The Styrofoam base was 4"H x 8"W.
Some Party Favors for the guest were wrapped Hershey Bars and Sugar Cookies. You can rent any of the displays seen here including this utensil bin. Bottle labels were placed on water and Gatorade bottles to add splash of color. Printables from Pink Pickle Studios. I can make these for your event too! Close up of the Party Favor cookies. included the item renting, coordinating ribbon, buffet label, and assembly. Luckily, I've been keeping super busy this month with dessert tables. However, I have not had a chance to post some pictures of my dessert tables. Here is a dessert table I was asked to do for a Oil Company located here in Midland, TX. TONS of CAKE BALLS!! It was a farewell party for a girl that was moving. So, we added some fun girl colors with feather boas and tissue pom poms. The venue was a local Mexican food restaurant. We made Red Velvet Cake Balls. Chocolate and Peanut Butter Texas Trash in apothecary jars. Everyone's favorite! Chocolate covered Oreo cookies. Cake ball cake that had 102 cake balls. Chocolate and Oreo Flavor cake balls were on the cake. The base was a Styrofoam circles measuring 6"H x 8"W.
Another sweet treat was our regular Cake Batter Sweet Texas Trash. 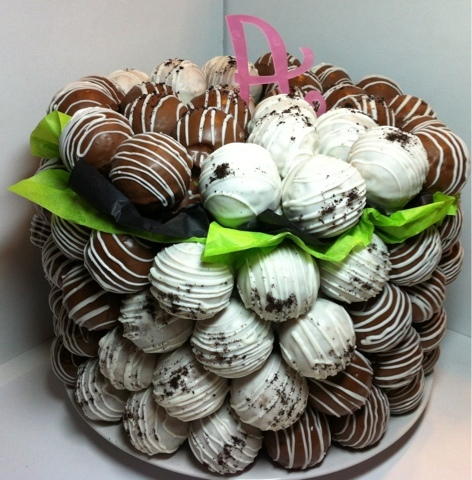 Lastly, another platter cake balls. These were the Carrot Cake Cake Balls. I did another dessert table last weekend, and they requested a cake ball cake. This one is a little smaller. It has approximately 65 cake balls. It had a 4"H x 8" styrofoam base this time. I will post more pictures of the whole dessert table soon! Here are two Father's Day treats I worked on this past weekend. They were chocolate cake balls and crushed Oreo balls. 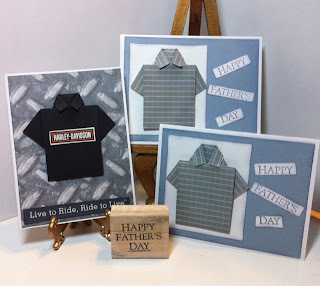 I hope all the Dad's had a great day! 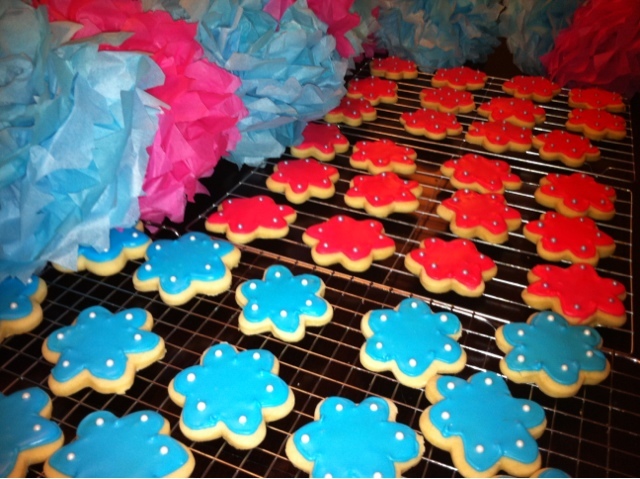 Some fun pool side flower sugar cookies for a little girl's birthday pool party tonight! 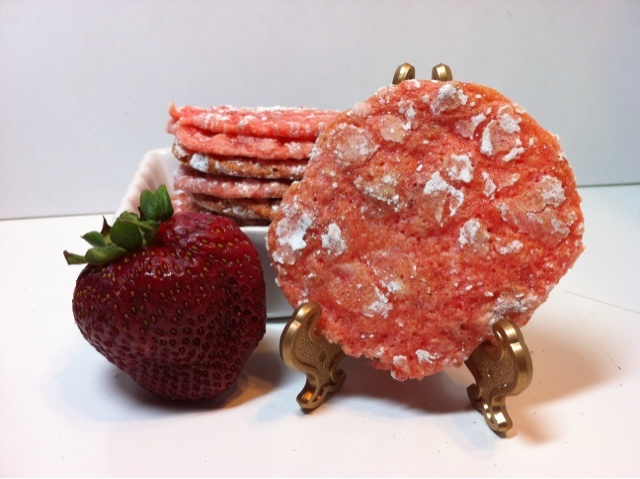 I tried making my Cool Whip cookies in a Strawberry flavor this morning. Very yummy and a fun pink color! Some Father's Day cards I made for the Grandpa's and Pappy's in our lives this morning ... at 6:30am after my Insanity Workout! My Dad is the Harley rider out of the group. Can you guess which one is his? 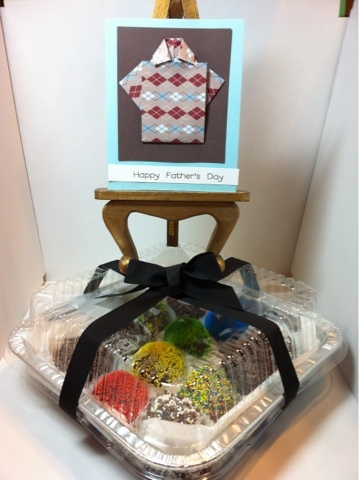 If you order some cake balls this week for Father's Day I'll throw in a similar Shirt Card for Free! But remember...you have to live in Midland, TX!